Here is a recipe that I would like to share with you that I originally found on foodnetwork.com and then adapted. It was an immediate hit with oldest daughter (then a toddler) and my husband! In fact, when I first served it, my daughter kept asking me for more – and she would usually barely touch the zucchini on her plate! It’s super easy to make, but takes a little bit of time to bake in the oven, so plan ahead. A simple vegan, dairy-free and egg-free recipe. This is a crispy & tasty way to serve up vegetables! Preheat oven to 450 degrees F (230 C), and line a baking tray with either aluminum foil or parchment paper. Drizzle olive oil over the sliced zucchini rounds in a bowl, and mix thoroughly until the zucchini pieces are well coated. Be generous with the olive oil! In a different bowl, mix together the finely grated dairy-free ‘cheese’ shreds, breadcrumbs, pepper and a pinch of salt if desired. Mix well. Coat each zucchini piece in the breadcrumb mixture until it is coated on both sides (may need to slightly press the coating onto each zucchini surface) then lay in the baking tray. Repeat with the other zucchini pieces. Place in oven and cook for 30-40 minutes, or until the zucchini pieces turn slightly brown and become crisp. Serve and eat while warm. Enjoy! I tried this recipe a few different ways and found that commercial bread crumbs seem to work a bit better than Panko bread crumbs, though Panko bread crumbs can still be used. Personally, I don’t think you need to even add a sprinkle of salt because commercial breadcrumbs tend to already have some salt (unless you find the unsalted version or make your own breadcrumbs!). 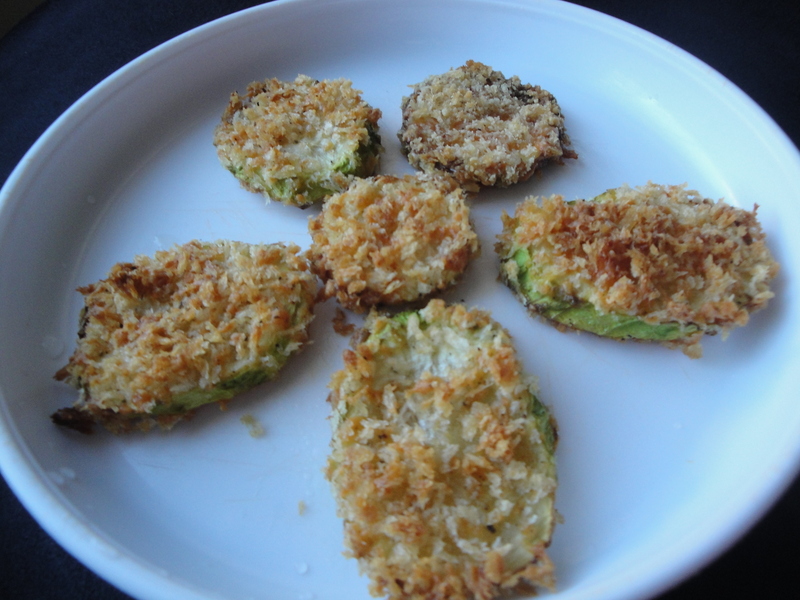 These can also be made more nutritious by dipping the zucchini rounds in a flax egg mixture (made by 1 tablespoon of flax seed meal mixed with 3 tablespoons of water and let sit for 5-10 minutes before using it) before coating them with the breadcrumb mixture. Try this recipe with other vegetables like yellow squash! Other tips: You can turn these into “zucchini fries” but it made trying to coat all 4 sides properly more challenging (though they still turned out well!). You can also try to bake the zucchini rounds without any ‘cheese’. I’m sure they would still come out crispy even without a ‘cheese’ component!